By Nadine Burke Harris, M.D. Our free event cosponsored with REDgen featuring Nadine Burke Harris on Saturday, February 10, 3 pm, at Varsity Theater is filled to capacity. Overflow tickets available for Weasler Auditorium available at Eventbrite. Please note, you will have to bring a ticket or confirmation to enter the Varsity. Dr. Nadine Burke Harris was already known as a crusading physician delivering targeted care to vulnerable children. But it was Diego—a boy who had stopped growing after a sexual assault—who galvanized her journey to uncover the connections between toxic stress and lifelong illnesses. The stunning news of Burke Harris’s research is just how deeply our bodies can be imprinted by ACEs—adverse childhood experiences like abuse, neglect, parental addiction, mental illness, and divorce. Childhood adversity changes our biological systems, and lasts a lifetime. 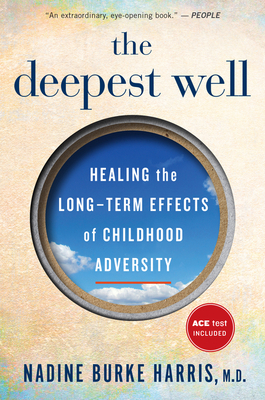 For anyone who has faced a difficult childhood, or who cares about the millions of children who do, the fascinating scientific insight and innovative, acclaimed health interventions in The Deepest Well represent vitally important hope for preventing lifelong illness for those we love and for generations to come​. NADINE BURKE HARRIS, M.D., founder of the Center for Youth Wellness in San Francisco’s Bayview Hunters Point, was recently named Surgeon General of California. She is the recipient of the prestigious Heinz Award in 2016, and lives in San Francisco with her husband and their four boys.